Ground Control continues to bring fresh ideas and innovate solutions to the Audi enthusiast. The GC camber plates for the Audi A3 chassis are designed for the racer who is looking for additional camber for their track car or aggressive street cars and the track-day drivers who need a simple alternative to "crash bolts". The camber is adjustable by loosening four allen bolts (wrench included) and sliding the upper strut mount. The plates are graduated with degrees, and the bolts are attached through a stainless steel load bearing washer that also serves as a pointer for repeatable adjustments. Recommended for use with the TRUE coil-over spring kits offered by Ground Control, there are also options that may fit your car. When used with spring kits other than Ground Control, the owner must take all responsibility for making the correct choices and installation. 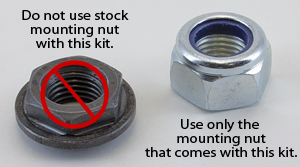 Do not use with the stock mounting nut. Provides 17mm total caster/camber adjustment.